Lurline's Place: Yes, It's Me! - DUQ Issue 131! Oh, where do I start? It is with great humility and happiness to think Creative Living Media, Lorraine, Deborah and Lauren have chosen to do a Profile on me to be included in the above Issue! 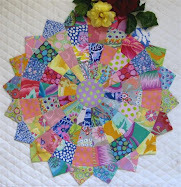 Thirteen years of quilting - almost to the day - I am so happy to think I have inspired other quilters in Australia! At the moment, I am having the time of my life being with quilty friends in real life and lots of friends in Blogland, too! 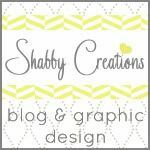 It doesn't get any better than this and I hope I can inspire others to begin a quilting and blogging journey! 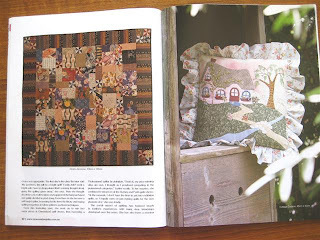 Many of the finest, caring people have come into my life because of patchwork and quilting - you know who you are and many thanks and love to you all!♥ Thank you, Maree for the mention on your blog! I have raided the shelves of newsagencies in my area - there are several people I would like to send copies to - wish I could do it for anyone who would like a copy! There's another two pages, but enough of that - these are my blocks for the Rainbow Quilt Swap! Oh, what a lovely quiet, uninterrupted day I have had - all nine done now, so too late to change my mind again (lol)! I'm in there with some of 'the guns of the USA' - hope I come up to the standard! This has been a lot of fun! Blocks will be in the post on Monday, Jane! I picked up my copy of DUQ today and I was so pleased to see your gorgeous face gracing the pages!!! And your name on the cover too :o)... woohoo!!!!! 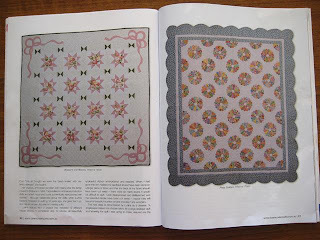 Your quilts (and the cushion) all look absolutely splendid, it's a lovely article and you have every reason to be feeling proud as punch .... congratulations Lurline :o)!!!! Congratulations, Lurline! Of course, we blog followers already know how inspirational and fun you are, so it's no news to us that you are! I'll have to get up early tomorrow to catch the newsagency before it closes. Can't miss that issue! Gorgeous blocks Lurline. I love the red & white theme. Congratulations on being in DUQ. Congratulations Lurline! You are such a lovely person and so generous and it's great to see you in print! Congratulations Lurline. Well deserved...you're extremely talented. 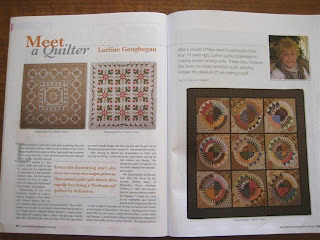 Happy quilting anniversary and congratulations, the spread looks fantastic. I will buy this copy for sure. You must be on cloud nine, I share your excitement! Need to pick up my copy! 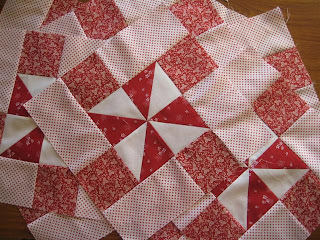 I just love those red and white blocks! Just so neat and pretty! A hearty congratulations Lurline! We are so very proud of you and it is such a pleasure to know you through your blog. Congratulations, Lurline! How exciting!! I'm heading to the international newsstand to see if they have this magazine; have never seen it before! I am so happy for you! How exciting! You do such wonderful work, it really is not a surprise that you would be recognized. Your block swap blocks are a dream too! What an honor, and rightly deserved! Everything you make is so unique and has a quality about it that is wonderful. Congratulations!! Oh Congratulations Lurline...how exciting is this...well done...You Go Girl!!! Congratulations on the article in the magazine.What an honor! Do you hear me screaming all the way from the USA!!! This is so wonderful. You and your family must be bursting with pride, I am for you!! BTW these blocks are wonderful too! You remind me of someone else that changed her mind too, Oh yes, me. I am so very happy for you Congratulations!! Wpw - congratulations Lurline! And you have inspired quilters far beyond Australia. I wish I could get the magazine. Thank you for sharing you celebrity-dom with us!! Congratulations Lurline-what an amazing feat. Like being on the cover of the "Rolling Stones"-lol. You must feel really chuffed. oh Congrats Lurline that is just so exciting!!!!! I sure hope I can find an issue here. My good friend loaned me her copy and I've just been reading and admiring. I'm so excited for you and thrilled to be able to say that I know you through your blog. Congratulations Lurline on your lovely feature! Wow, how exciting for you Lurline. Congratulations. I'm going to hunt down a copy. You bought all the copies up near us...no wonder I couldn't find the mag! Congratulations to you, Lurline. How exciting it must be for you to see both your name and lovely work in print. I wonder if I can find a copy way over here in Canada? Must keep an eye out for it. You are a star! Your blocks are just glorious! Congratulations on the article, I'll have to get a copy to read. The blocks are looking fantastic. Congratulations Lurline. This is fantastic. I have an on line subscription so I will be able to read all about you. And you are allowed to be proud of yourself. You make the most beautiful things! This is so wonderful. 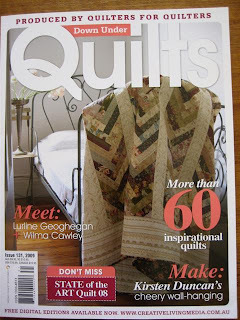 I had commented in your previous posts that your quilts are so beautiful that you should be in a magazine...and here your are!!! You must be so excited. I'd be smiling from ear to ear for a month. Congratulations, Lurline! Applause, applause, applause - take a bow, please. I wish I could read the article on line. Or is there some place to order the magazine? I'd love to read all about you. Congratulation Lurline....it is so exciting to be published. Your work is lovely and so deserving of a place in a popular magazine. don't stop now....your publishing journey has just begun. Oh my gosh Lurline you are a star! How wonderful for you. I know how it feels. It feels good!!! Your Blocks look Great...Love them.!! Oh wow you are the best. Well done. You deserve the accolades. You do wonderful work. Unreal Lurline. You have made my day.